Raclette is eaten hot - the name comes from the French 'racler' or 'to scrape' - as the savory melted wheel of cheese was traditionally heated over an open fire before being poured over an accompanying dish of potatoes. 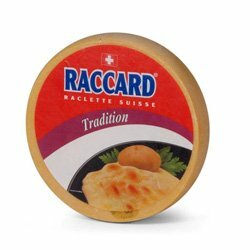 Histor-ically, Swiss shepherds would eat Raclette in the summer, as a filling and delicious meal. Today, the preparation of Raclette, which is the Swiss national dish, has hardly changed over the years. Designed as a meal to share with friends, the Raclette cheese is heated to bubbling point and served with potatoes, pickles and cold meats. The Raclette wheels can be cut in half, placed in a special Raclette cheese holder to hold the melting cheese wheel in place, and served in the traditional way; it is also available in precut square slices adapted to fit raclette grills, appliances that are available in stores. An authentic, natural product, Swiss Raclette cheese is still manufactured in accordance with the original recipe. Produced from creamy cow's milk, Raclette's incomparable flavor is due to the rich flora of the lush, Swiss countryside. A full-bodied savory cheese, Raclette is usually eaten hot, but can also be enjoyed in cold slices; whatever your style, this cheese makes for a wonderfully authentic family meal or dinner with friends. If you have any questions about this product by Raccard, contact us by completing and submitting the form below. If you are looking for a specif part number, please include it with your message.